Republicans in Congress have proven, once again and without a shadow of a doubt, that their loyalty lies with Trump — and Trump alone. Your voice is needed now more than ever to stop them. The House Freedom Caucus, led by Trump sycophants Rep. Mark Meadows and Jim Jordan, has officially introduced a resolution to impeach Deputy Attorney General Rod Rosenstein, the man responsible for overseeing special counsel Robert Mueller's investigation into Russian interference in the 2016 election and obstruction of justice. 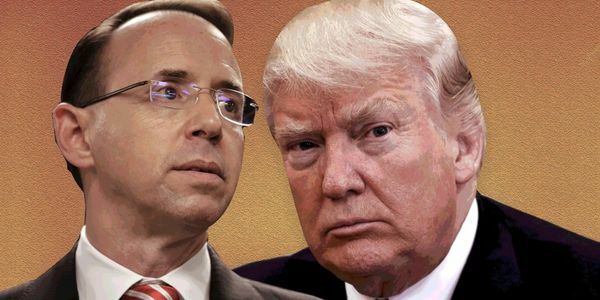 If Rosenstein is ultimately removed, he would assuredly be replaced by an official who will comply with Trump's desire to end the probe once and for all. Not only will he fail to answer for his crimes, but he will be free to continue with them — to grant Russia unprecedented access, to line his pockets, and to obstruct any further attempts to rein in his autocratic tendencies. Enough is enough. We will not stand idly by while Trump's lackeys launch this shameful attack on a dedicated public servant and his rightful investigation into the single most corrupt president in modern American history. We demand that Congress allow justice to run its course. It is Congress's job to hold the president accountable for his wrongdoings. Instead, they are acting as this thugs, carrying out his nefarious plan in broad daylight against the will of the American people. These men are not representing the people they were elected to represent; they are representing the villain occupying the Oval Office. Here are the facts. House Freedom Caucus members have moved to impeach Rosenstein for not being responsive enough when asked to disclose a slew of evidence from an open criminal investigation. The resolution charges Rosenstein with "high crimes and misdemeanors" for failing to produce certain information in a timely enough manner, despite the fact that the DOJ has already provided more than 800,000 documents—some even pertaining to the closed investigation into Hillary Clinton's e-mails. In their resolution, Republicans even cite an action the Justice Department took in October of 2016... six months before Rosenstein was sworn in as Deputy AG in April 2017. Their justification for impeachment is something that happened six months before he was even in the position. If Republicans are successful, this would be the first time that an executive branch employee — other than a president — is impeached in 122 years. The ongoing investigation is not a "witch hunt," as Trump and his Republican shills claim, but a legitimate probe that has so far resulted in a staggering 191 criminal charges against 35 defendants. Rosenstein is the only person standing between the completion of this investigation and it's untimely dissolution. Add your name to ensure that Congress protect Deputy AG Rod Rosenstein and allow Mueller's investigation to continue uninterrupted by dangerous partisan politics.